The vast majority of the outfits that I’ve worn over the past month have been of the casual variety. I’m coming towards the end of my masters degree in PR and I just don’t have the time for nights out partying in pretty dresses. Its all about comfortable and casual but put together looks for me at the moment but fear not, the end is in sight and I’m hoping my birthday next month will call for some pretty party dresses. 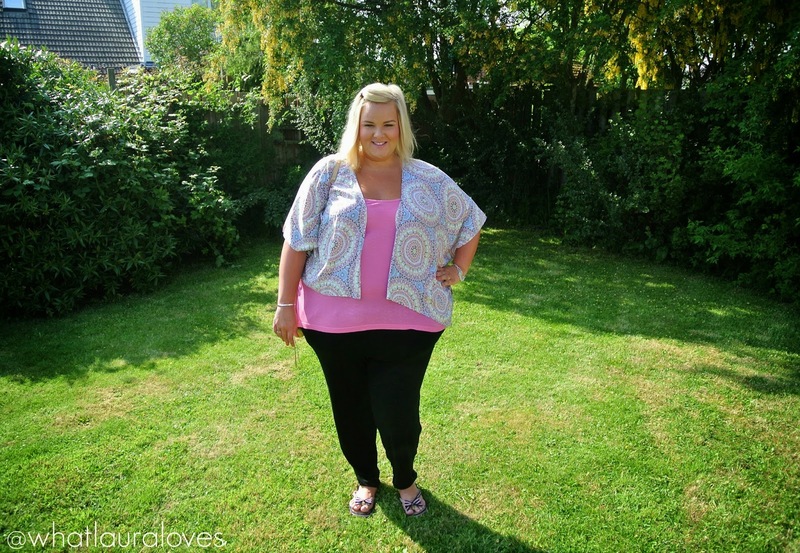 In todays post, I’m wearing the Geo Print Kimono Top which is from the Bethany Mota line at Aeropostale. I love the mix of muted bright colours in the geometric design. It really reminds me of a kaleidoscope. 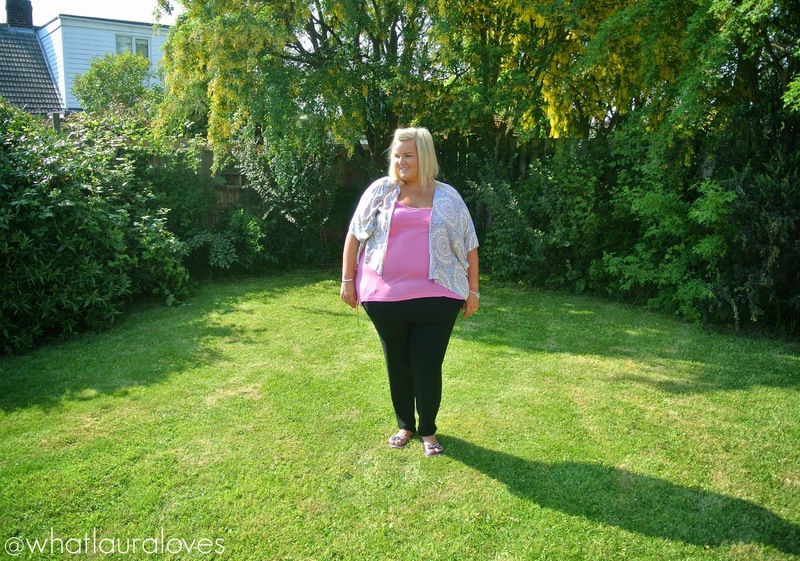 For my top I kept it plain and simple with this easy to wear swing vest from ASOS Curve. I have this top in black as well as pink and what I love about it the most is that it is long enough to cover my bottom so I can wear it with leggings if I want to. In this outfit, I’m wearing it with some tapered jersey trousers from Next. If you’re looking for some super comfortable trousers that you can dress up or down for work or play then these are definitely the trousers for you. I have them in black, navy and white and for only £18 they’re incredibly good quality. For accessories, I popped on some super cheap flip flops, carried one of my favourite bags and for jewellery, I kept it simple with some of my favourite pieces from Monica Vinader and Guess. What are your favourite go-to outfits at the moment? 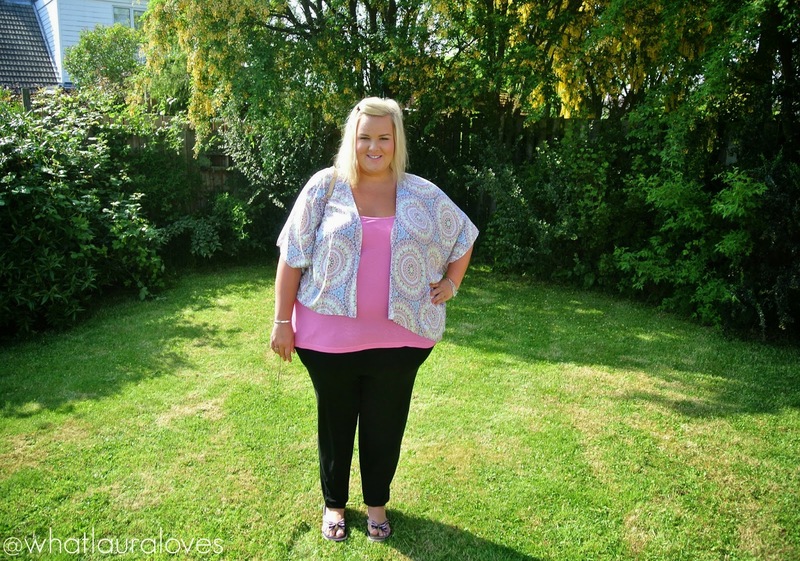 Click here to enter my HUGE giveaway to celebrate blogging for 4 years!